After penning a first book featuring his personal advice for life, Nick Offerman decided to look outward for his second volume, Gumption: Relighting the Torch of Freedom With America’s Gutsiest Troublemakers. 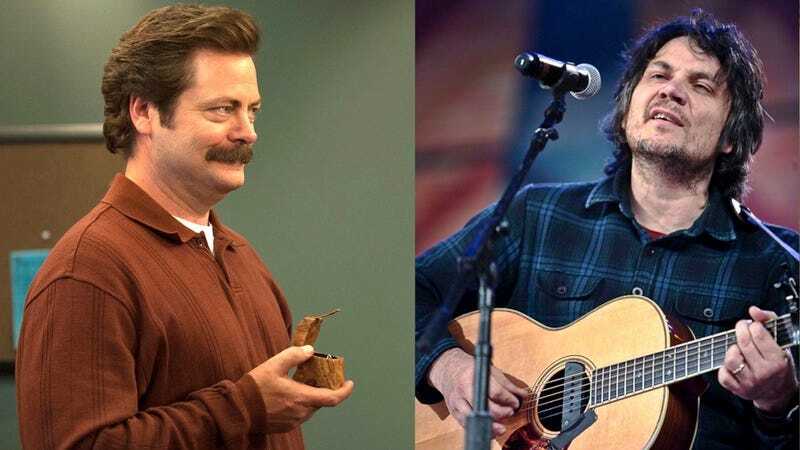 In it, Offerman highlights 21 figures he considers “great Americans,” including Wilco’s Jeff Tweedy. But it turns out Offerman doesn’t only consider Tweedy a national treasure; he wants to marry him too. Like most humans, I am very moved by music. It can rile me up or make me incredibly happy, or it can move me to tears, all with a commensurate amount of relish. Music shared among friends and family, I have found, is one of the most powerful bonding methods we have as monkeys who can wear jean shorts and press “play” on our music devices with our handily opposable thumbs and fingers. So when Pat, Pat, and Paul brought me Wilco, in the form of their first two records, “A.M.” and “Being There,” I was born anew. Jeff Tweedy’s music spoke to us, and much of the eared world, with a compelling relevance. It was clearly our music. How did he do it? How could he see inside me? Little did I realize that I was enjoying the song stylings of my future husband. Read the full except over on Salon.